Neoliberalism is a political project which sophisticatedly exploits the fictitious “free markets” ideas professed by mainstream economists and aims at reshaping the functions of the state and its institutions, in order to change the distribution of capital and wealth in a society. 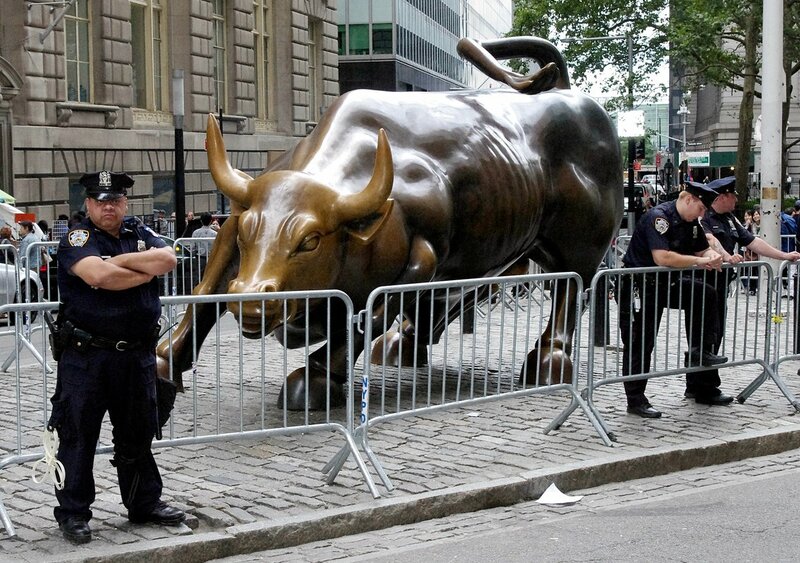 In the years following the 2008 global financial crisis and mass anti-austerity and pro-social justice protests in 2011 (Occupy Wall-Street in the US, the M-15 movement in Spain, the J-14 in Israel, and so on) — Neoliberalism is on the defensive. These events, additional developments as well as an enormous body of academic knowledge posed a fundamental challenge to this political project. But one must admit that neoliberalism is fighting back, in many areas reinventing itself and even intensifying its mechanisms. Yet, in many important and crucial cases, in different societal and political fields around the world, neoliberalism is conquered indeed. The question I would like to tackle, therefore, is: under wich circumstances does it happen? When neoliberal policies and initiatives get overturned? In other words: How Neoliberalism could be defeated? Well, for sure, political struggles depend on local contexts, discourses and coalitions — that’s not new. But I would like to point out on something I keep finding strictly relevant regarding combating the market fundamentalism in its various forms: specific actors and organizations embracing neoliberal logics and promoting “profit above all” practices must be publicly and directly named and shamed, openly disgraced and continuously condemned. Unlike in the 1980s, 90s and early 2000s, when the worship of the Golden Calf and its prophets was the opium of the people, while the rich have been looting the coffers in broad daylight, scattering fairy tales about the invisible hand which will soon spread prosperity around for all and the wealth will trickle-down like the Manna from the sky — unlike in those years, nowadays are different. Change has been and is occurring. The immoral infamy of neoliberalism — resulted in growing inequality which spawns violence, economy of exclusion, idolatry of money and undermined democracy — is on display and the Emperor’s New Clothes’ smokescreen dispersed, revealing the pitiless ideology of capital. Therefore we must speak out loudly against the carriers and implementers of neoliberal ideas and plans, which unlike a decade before, try to conceal and disguise their actions, understanding the power of public protests. Recently we witnessed a remarkable example, that showed the effectiveness and leveraged influence – especially in this era of social media – of “Name and Shame” practice applied towards the University of Warwick, that abandoned its own motto “Mind moves matter” in the race for profits. Several months ago the University of Warwick decided that its hourly paid academic (teaching and research) staff will be outsourced and employed by an owned subsidiary company TeachHigher. This was a typical demonstration of neoliberal agenda wedded to the privatization of public services in general, and of higher education particularly. But the intention to carry out this “flexible workforce scheme” aroused just protests on the ground from unions and student groups, and on several blogs and web news sites, including our online community. The post published on April 6 “Name and shame: Warwick University to outsource academics to a subsidiary” (on this blog as well on all the ES/PE networks) has gained a huge attention and has been constantly reposted, shared and retweeted, mostly titled as “Name and Shame”. This was an excellent common execution of a focused campaign (that went viral) against an academic institution that acted to subordinate the creation of scholarly knowledge to the production of profits. Now, I am glad to tell you that this “Name and Shame” campaign succeeded! A week ago, the University of Warwick announced that “ongoing scrutiny of Teach Higher has become a distraction and Teach Higher should be disbanded.” The fascinating point is that Warwick actually admitted that the university management meant to cut costs on the backs of the most vulnerable academic workers, as it is clearly written in the official statement: ” [Departments] will be responsible for developing its own approach based on the principles of transparency and fairness around nationally-agreed rates of pay. […] addressing these inconsistencies will cost more and the University is making provision in its financial plan.” Say no more. 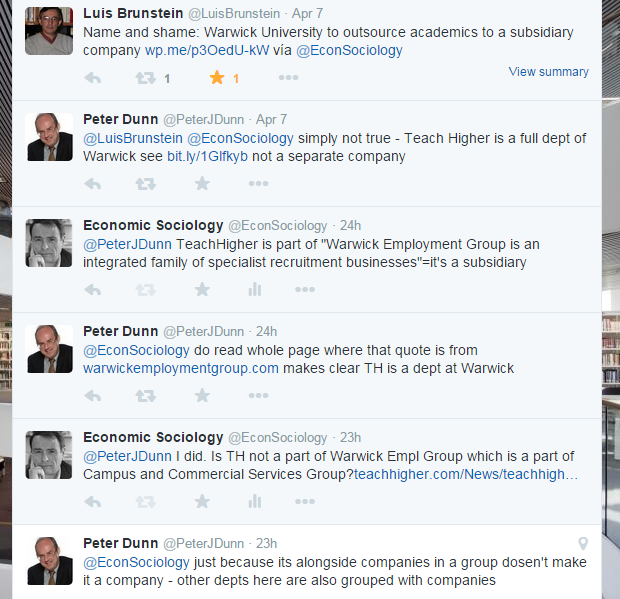 If you do want more, take a look at this sort of conversation I had with Warwick spokesman, in which he preferred to quibble about corporate governance definitions, instead of expressing concern for the quality of research and teaching due to gross violation of essential contract, based on the Enlightenment truths, between the university and its scholars. But in the end, he – as a representative of neoliberal aspirations for more so-called “efficiency” instead of liberal values for more education and the social good – failed. In conclusion, there is a lesson we all learn from this victory: publicly name and shame specific actors and organizations (in politics, in the academia, in the press and everywhere) embracing neoliberal logics and promoting “profit above all” practices, directly disgrace them and continuously condemn them. Even small actions (like a post on Facebook) may feed and lead to great consequences. It works. Neoliberalism could be defeated. It could be fought off and economic pressure of the market could be repelled in the current public atmosphere. The additional critical part of this just struggle is embedded in the Economic Sociology and Political Economy global community’s purpose to disseminate the insights of socio-political research of the economy, equipping the public, the civil society and academics with a powerful scientific arsenal to lead the intellectual fight against market fundamentalism, economicism and neoliberal ideology. Share this news. Share this call. Share this goal. This entry was posted in Name and Shame, Oleg Komlik and tagged academia, higher education, neoliberalism, public sociology. Bookmark the permalink. 5 Responses to How to defeat Neoliberalism? Name and shame its carriers. Together we did it– and we succeeded! No one can delete another. If you take a small review you can see how Qatar is achieving an increase in economic growth ( neoliberal country ) and America (capitalism country) is achieving the worst among its history. No matter what is the system’s name what matters is the policies and the correct view to the long run. It is also important to map its networks (as suggested in Yannick Rumpala, “Knowledge and praxis of networks as a political project,” Twenty-First Century Society: Journal of the Academy of Social Sciences, Volume 4, Issue 3, 2009, Pages 277-295). evolved rapidly from crisis to be part of the global economy of the last decades of the 20th century.